For the last 18 years or so, I’ve been playing Mom’s guitar that she bought in high school with her babysitting money. I’ve really been quite fond of it, if more for sentimental reasons than for any musical qualities. But over the last couple months, a few people have been floating the idea at me of getting a new guitar. The fact that two of our primary guitarists at Ananda Palo Alto recently moved away probably has something to do with it — I’m on accompaniment duty much more these days. So, while I can muddle along on my own alright for quite a while, the fact that other people have to listen to me finally got me out shopping. Gryphon Stringed Instruments is like Ollivander’s Wand Shop for guitarists. I spent about 3 hours there yesterday, looking for one that would shoot red and gold sparks when I picked it up (the wand chooses the wizard, after all). None of them quite did in the literal sense, but I came away quite happy in the end anyway. I surprised myself a little with how important the visual appearance turned out to be for me, but really, if I’m going to spend actual money on a new instrument, I’d like it to be beautiful in every dimension possible. 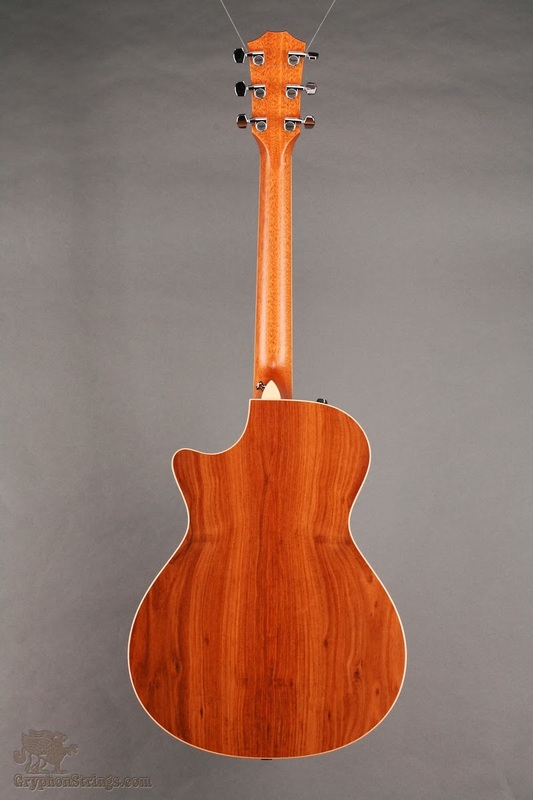 One of my favorites had simply gorgeous koa wood back and sides, but an overly bright sound that was a bit too much against my singing voice. Probably the best-sounding one of my short list was mellower and smoother, but had other points against it. First, it was just a standard brown-and-black ugly. And second, I felt an odd sort of resistance from it when I played it. It took me a little while to notice the pattern (I was playing so many guitars that day), but I felt that I kept making unusual mistakes, and that the guitar in some sense didn’t want to cooperate with me. 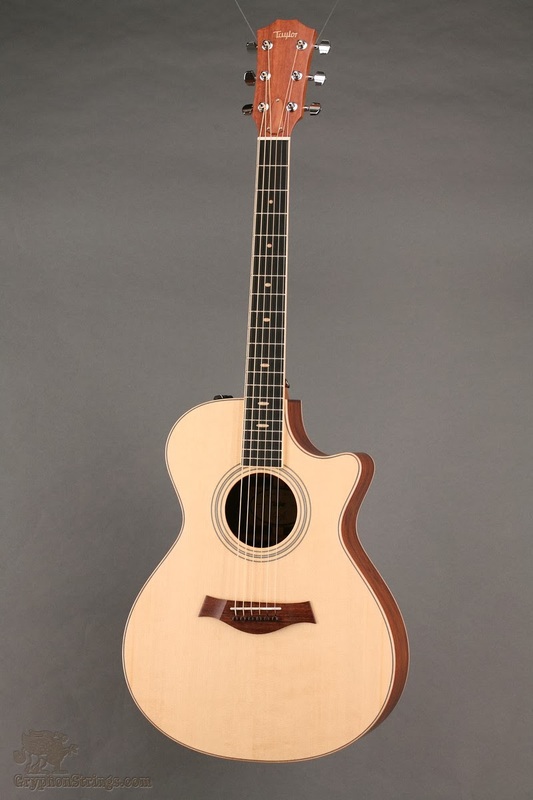 Which leads us to the final winner, a Taylor 412-ce limited edition with granadillo back and sides, a simple but beautiful front, and fretboard dots that somehow remind me more of the chakras than other ones do. The body is a little more petite than most, which I rather appreciate. You can check it out on Gryphon’s site, or on Taylor’s. The tone is brighter than the previous one mentioned, which I like, without being as overpowering as the first, and it works well for fingerpicking (something this model was particularly designed for). The strings don’t all blend quite as well for some kinds of strumming, but I think some of that will smooth out as we get used to each other. And most importantly, this guitar felt like it wanted to play with me. One of what you might call the “red and gold sparks” was the moment I did a double-take: “Did I really just play a barre chord? That was too easy!” I got the distinct impression that the instrument was trying to help. The other thing guitar shopping reminds me of, besides wand shopping, is an afternoon of speed-dating, followed by a wedding. There’ll be some amount of trepidation no matter who you go home with, but the one that wants to help make the relationship work is pretty likely to be the best choice. Today is the anniversary of Yogananda’s birth, and so Seraphina got to jump right into the middle of things, playing with me both for the birthday celebration last night and for Sunday service this morning. Very appropriate, as I consider her to be both Master’s birthday gift to me and my birthday gift to Master.